OHH! I've never see the YO option instead of the KFB! I cant wait to try this one out! I am just learning this pattern, but I can't figure out how to switch colors when knitting the rows. Help??? All you have to do is drop the first color and pick up the new color, and begin knitting with it on whatever row you change colors. hello. i seem to be losing a stich at the end of each row (not purl row) im down to 25 stitches! started with 30. please help! this is a great tutorial btw. mine already looks great but is starting to disappear on the left hand side?! Hi, thank you for this. I have a question regarding casting on. Do I just cast on a straight line of 14/ 28/ etc. or is there another method? You just cast on using whatever method you prefer - long tail, Twisted German, backward loop, whatever - in a multiple of 14 + 2. The fabric will naturally make the chevron points as you work the pattern. Hice 18+2 para acentuar la curva. Quite y agregue 3 puntos. Super cute & perfect for this winter. Does anyone have tips on turning this into a hat or a beanie? Could I start with an inch 1x1 rib & then knit this pattern on top? Would I use the same pattern if I knit in the round? Is there a special way to cast off to create the peaked edges? Or can you just use any cast off method? Mack-a-doodle, the standard knitted bind off works perfectly. This pattern is so much better than the usual ripple pattern! I made a small sample and there is some curling at the bottom. 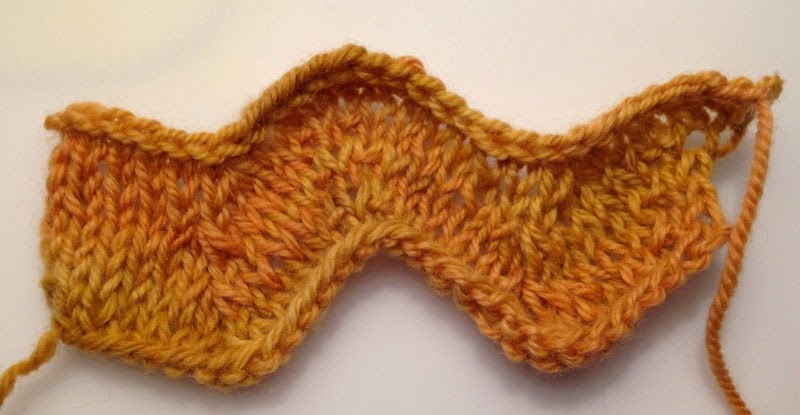 Should there be a few rows of garter stitch or will it stop curling after several rows?